Whew! It’s been a while! Food has changed a lot for me over the course of the last few months. I’ve eliminated added sugar to my diet and eliminated grains. Let me tell you, the first month was really rough! I don’t recommend that everyone in the world follow this sort of diet. However, it has made me feel a lot more energetic. I also feel less ravenously hungry all the time, which is definitely a good thing for me. Of course, I was told to give up alcohol completely on my journey and I did for a time. However, I have added it back in. I’m now working on consuming in lower sugar ways. 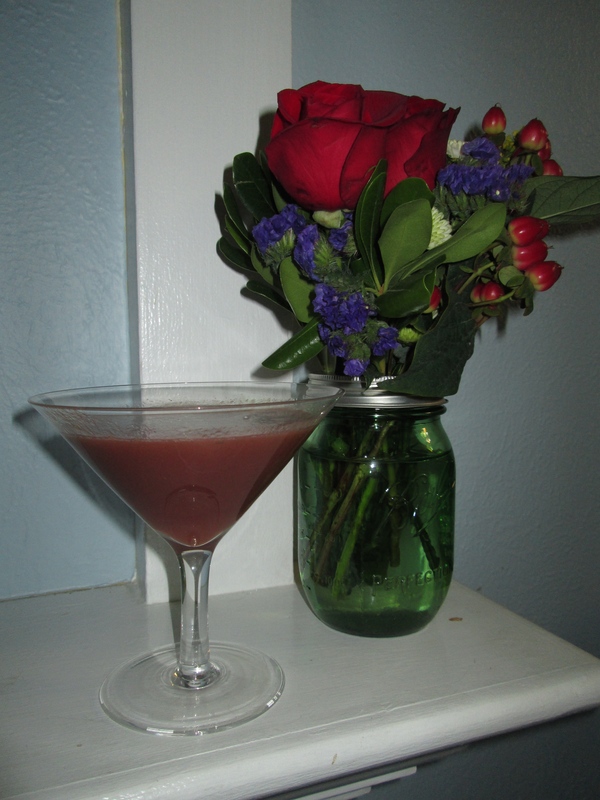 Here’s a delicious drink that I made (and shared) the other night! What I love about it is that it uses the whole fruit, so you aren’t getting rid of the fiber from the fruit, it isn’t excessively sweet, and it uses less than a serving of fruit per drink. The cilantro gives it a nice twist in flavor and also dulls the color so it’s a bit dusky. It’s a great summer drink! Cut the leaves off the strawberries and throw them in the blender with the lime juice and vodka. Add the cilantro to taste. It’s pretty good without the cilantro, but it’s pretty amazing with it! Pour the mixture into a martini glass about 1/2-3/4 the way full and top with sparkling water. We split this evenly among three glasses at my house and it was delicious! You could strain it if you’d rather not have pulp in your drink (I don’t mind it at all). You could also add ice to make it colder/frozen, which I think would be really lovely as well. It would also be a great mocktail if you choose not to add vodka. That sounds yummy, I’ll have to try it. I bet it would work with raspberries too. Last night I tasted a watermelon martini with mint. You might want to try that too! That sounds delicious! Watermelon is one for me to shy away from a little more (along with pineapple and bananas), but I can have a little!